(which will have an orange flag flying on it) and a near-by mark. The near-by mark is usually an orange inflatable mark or an orange ball with a flag attached to it. For club house starts the line is from the centre of the crows nest (the race box on top of the club house) to a mark on the reservoir - usually "Club" mark. For normal club racing Derwent Reservoir Sailing Club uses either flags or coloured lights to start its racing. A flag or light will be displayed as a warning signal for a particular fleet of boats. At DRSC this is usually a 4 minute warning. Until your warning signal is displayed you should keep clear of the start line to ensure that you don't get in the way of other boats that may be starting before you. At DRSC two minutes before your start a preparatory signal (another flag or light) will be displayed. 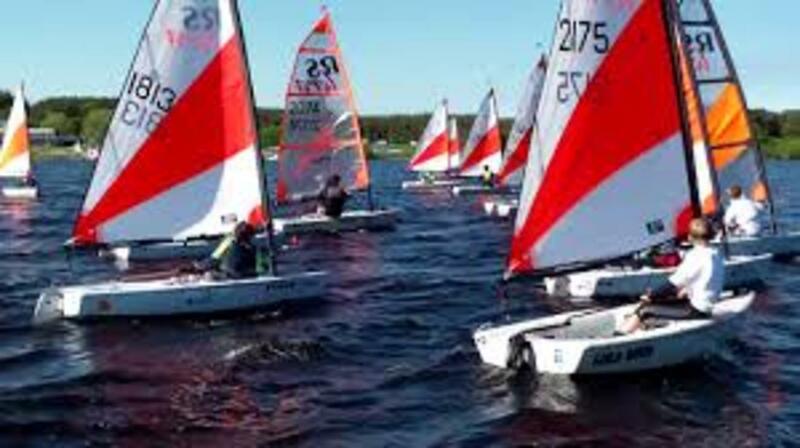 Then when your fleet is starting the warning signal will be removed and you can cross the start line. For special events you must check the sailing instructions for signals and times of signals as they are likely to be different to the normal club starts. At DRSC we normally display the course either on the white board outside the office or on a board on the committee boat. DRSC has 25 fixed marks which are all named. Each mark begins with a different letter of the alphabet and the course is displayed by listing the letter on the board in the order they are to be rounded. So J - S - N would mean you had to sail round Jetty Mark, South Mark and the North Mark in that order. Letters are normally displayed with either a red or green colour. Marks shown in red are passed to port (the mark passes the left hand side of the boat), marks shown in green are passed to starboard (the mark passes to the right of the boat). Mark X is used to indicated an extra mark which will be an inflatable mark. If more extra marks are needed these will be shown with 1, 2, 3 etc. If there is a picture of a Gate on the course board you must pass through the start finish line. You must not hit any of the marks on the course with your boat. If you do hit a mark you must do a 360° penalty turn (a jibe and a tack) once you have passed the mark and are out of the way of other boats. Initially you'll just want to use these rules to stop you damaging your boat or anyone else's boat, however once you get more experience you may want to use some of the rules to obtain a tactical advantage over others. If you'd like to understand the rules about rights of way in more detail you might want to check out Sailmaker UK Halsey's website. If you break one of these rules you should undertake a 720° penalty turn (2 jibes and 2 tacks). Finishing is pretty simple - you need to cross the line which for most club racing will be the same as the start line. Club races normally run for a set amount of time 45-60minutes rather than a set number of laps, so to let you know you are finishing the shorten course flag will be used. The committee boat will also display a blue flag to show it is a finish line. You will normally get a toot on the horn to let you know you are finished although the rules don't require it. Make sure once you are finished you don't get in the way of others finishing. There are a few extra flags that you'll probably also want to understand. if you don't remember what they mean, then during club racing just ask!